Axis Of Oversteer: Raising the "Titänak": From drowned to race ready in three hours! Raising the "Titänak": From drowned to race ready in three hours! 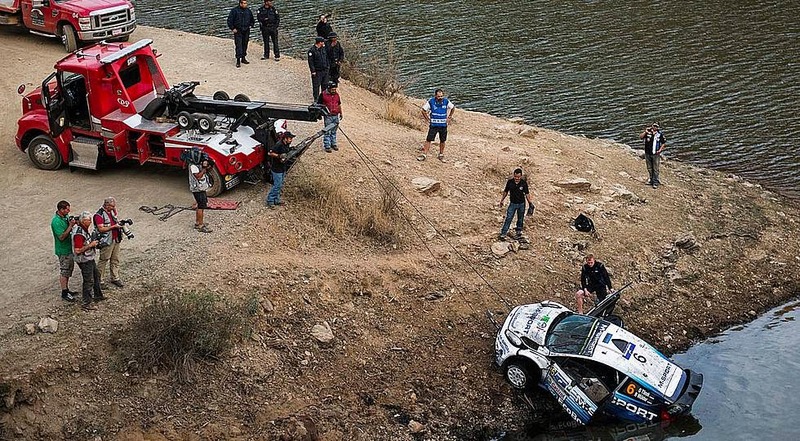 I'm sure that by now you've seen pictures of WRC's Ott Tänak Ford Fiesta sinking in a Mexican reservoir on just about every other car site on the internet. What you might not have read about is how the team, M-Sport, was able to rebuild the car overnight after it had been submerged for 10 hours! "In the day's most terrifying off, the Estonian's Ford Fiesta RS WRC became submerged in a reservoir. Caught out under braking over a compression in the road, Tänak damaged the front-right suspension of his Ecoboost-powered Fiesta, 2.6 kilometres into the first stage of the morning (SS3, Los Mexicanos 1, 9.91 km). Unable to make the following left-hand corner, he and co-driver Raigo Mõlder were forced into a roll down the steep embankment – coming to a stop in the deep water. Thankfully both driver and co-driver were unhurt in the incident, and were determined to continue the event. Showing true professionalism and determination, Mõlder even rescued his pacenotes from the watery depths – heading straight back to the hotel to dry what are one of a rally driver and co-driver's most precious pieces of equipment. The team were determined to see the crew back on the stages. Despite the car being completely submerged for almost 10 hours, M-Sport's technicians were prepared to work throughout the night in an effort to repair the Fiesta, and repair it they did – with the help of both Tänak and Mõlder who stayed by their team's side until the work was complete. Changing the gearbox, fuel tank, turbo, cooling package, boost control valves, electronic components, brake components, front and rear suspension components as well as a number of cosmetic components, the team also repaired the engine block and drained the engine of excess water. Completing the work in just three hours, it was an outstanding job by the technicians who have once again proven themselves to be in a true class of their own. To complete this epic story, the number six Fiesta RS WRC was driven into parc fermé by Tänak and Mõlder...."